MASAKA– President Yoweri Museveni presided over the commissioning of Bishop Leonard Sserwadda, leader of the of the new South Buganda Diocese Pentecostal Church of Uganda. The ceremony took place at the Liberation Square in Masaka Municipality in Masaka District. The ceremony also saw the President donate a new Pajero car to the new Bishop to enable him travel in his Diocese to fulfil his evangelization work. The President, who also laid a foundation stone for the building of the diocesan church advised Christians to continue preaching a multi-dimensional gospel that encourages all believers to work hard as opposed to merely waiting to inherit the Kingdom of God. “In 1962, I passed here and went to Nabugabo that had a Christian camp. I was almost close to being a bishop but I disagreed with the Born-Agains. They said that we are just passing through life and we are visitors with a heavenly home. They added that the birds of the field neither sow nor harvest but are fed. So they were telling Christians not to work but just pray. I disagreed with such philosophy. A human being was separated from all creatures so that he takes dominion over them,” he said. He added that Christians ought to follow the example of Jesus who was a preacher as well as a worker and used to work in the carpentry of His foster father, Joseph. 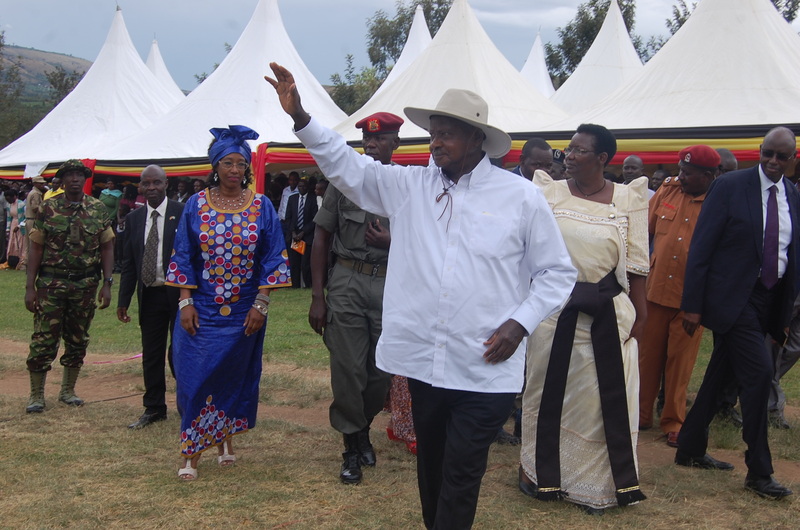 Museveni also commended the Christians for simplifying his work by preaching and living the gospel of wealth creation. In his maiden remarks, Bishop Serwadda thanked the President for loving the people of Masaka and for his role in strengthening the Born-Again faith through encouraging them to teach people how to create wealth for themselves. “The Born Again-church was just known for dancing and building ‘biwempe’ churches, but we are past that stage now. You made a statement saying that you never start a war that you do not finish. Even this war on poverty that you started, I know you will finish it,” he said. He further appreciated Museveni for the comfort that he brought to the people of Masaka during the tragic times of the murders in the region, by visiting them and offering his condolences.